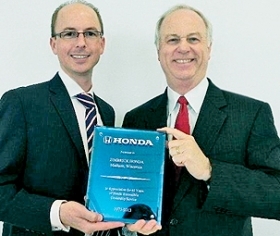 (Photo at left) Tom Zimbrick, right, of Zimbrick Honda in Madison, Wis., receives a 40-year award from Josh Beckner, American Honda Motor Co.'s senior district sales manager in the Chicago area. Jack Weyers, left, and Tom Abbott of Montrose Nissan in Montrose, Colo., received a 25-year award from Nissan North America. 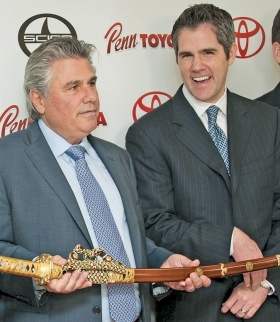 Abbott is dealer principal; Weyers is general manager.